Are you looking for the ultimate low bow adidas hockey stick review? Well you have come to the right place and you have also just found the right stick, the adidas TX24 Carbon hockey stick review right here on reviewhockeysticks.com is an awesome hockey stick. adidas TX24 Carbon hockey stick is a low bow hockey stick with a 24mm curve just 200mm up from the ground. The low bow on the TX24 makes it great for controlling the ball, dribbling with super cool 3D skills and letting the ball go forward with supreme power. It’s not just about bow shape with the TX24 either, the hockey stick looks incredible, the red and matte black mix together beautifully on this stick and it feels great in your hand with the adidas TX24 carbon featuring adidas’s top of the range chamois feel grip tape. Power doesn’t just come from the benefit of the low bow on the adidas TX24, with 90% carbon fibre and no fibreglass the adidas TX24 carbon we review has the maximum carbon mix in the material composition to through loads of hitting power at the ball. 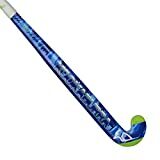 With the adidas DUAL rod system in the core of the TX24 this hockey stick feels really stiff and clips the ball very very hard indeed. Because of the shape of the XXTREME shaft on this adidas TX24 hockey stick it makes it one of the best low bow sticks I’ve review. It’s low which is unusual to me but there’s not a weird open face and it just seems to balance really nicely which made it very easy for me to adjust to. What I would review as the best thing about the adidas TX24 Carbon hockey stick though is the weight. I played with a Superlight verson, kindly provided to me by adidas and wow it’s light. I am a recent convert to lighter hockey sticks, previously liking a big chunk of wood in my hands and the lightness of the TX24 is something special. Right at the low end of all weighted hockey sticks, the adidas TX24 can be thrown around with easy but still connects to the ball with power and stands up to strong tackles with ease. Overall the adidas TX24 Carbon hockey stick is up there with the ultimate low bow sticks and should be a serious choice for any attacker looking for a top end carbon hockey stick for close ball control and shot accuracy.